Tipped as Magaluf's most exciting new party palace, Hotel BH Mallorca is a stylish getaway designed for pure fun. This adult-only property in Mallorca's party capital is next door to the world famous superclub BCM and near to some of the most spectacular beaches in the Mediterranean. If you want days spent enjoying pool parties, an adults only waterpark and sandy beaches on tap, this four-star hotel will tick every box. 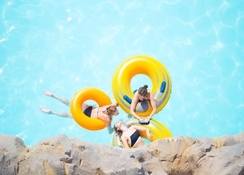 Couples and fun-seeking party people will find everything they desire at Hotel BH Mallorca - reputed DJs play during the summer months ensuring the party never stops. 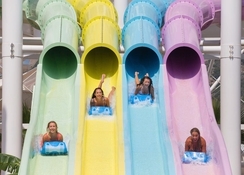 Guests can also splash around in the hotel's own waterpark and up the adrenalin factor on thrilling rides and slides. With beach parties, lively bars and the vibrant nightlife of Magaluf on your doorstep, those craving some extreme party-fun in the sun need look no further. Watch out for some famous faces (think David Guetta and Jess Glynne) at this trendy summer destination for the party crowd. Located just 5 minutes walk from the beach. A range of shops, bars and restaurants are located within a 1 minute walk of the property. The hotel is just 300m from superclub BCM Magaluf which hosts parties and events during the summer. Palma de Mallorca Airport is 18 km away. The hotel has 656 well-furnished rooms and all come with Wi-Fi, TV and air conditioning. In the hotel complex there are also BH Apartments and BMC, a budget hotel. Each room comes with a TV, WiFi, mirrors, a fridge and balcony. Toiletries and hairdryers come as standard. BH Mallorca Apartments, part of the BH family, are situated just a stone’s throw away from the main hotel. The apartments feature a bedroom, living room, balcony and a kitchenette, equipped with fridge and microwave. There are two buffet restaurants and snack bars within the BH complex. Mojito Beach Club in the apartments is the ultimate beach bar to sip sangria in after soaking up some rays by the pool or beach. The hotel has its own adults-only waterpark, Twisted, with nine exhilarating rides, three giant Jacuzzis and a wave pool. The Island Beach Club is famous for its buzzing pool parties. Renowned DJs play twice a week at the Stage Arena at the hotel. Guests can collect room keys from reception. No guests under 17 allowed. This hotel is second to none guys...I went on this holiday for a well deserved break so I left kids at home and booked! I had such a great time at an amazing hotel...I am going to book again for the same time next year! !The location is great and in the heart of all the action and it was a in walk to the strip n McDonalds n Pizza Hut, thank goodness coz I don’t like walking far. Before I booked this hotel I read some of the the negative reviews regarding the food; however, I must say that the food is well presented, fresh and delicious! There is a large variety of food and the restaurant also have theme nights e.g Italian night = lasagna n pizza etc. The rose, red n white wine was tasty and on tap (and the beer) so just keep refilling n go!! Lol. The restaurant staff very patient and friendly, shout out to waiter Sunday for his pleasantries. THANX SUNDAY! The rooms, actually all the hotel was immaculate and the cleaners cleaned our room every day and provided us with fresh towels everyday also (and loo roll) lol. The showers worked well and they provide a good hair dryer, shower gel, shampoo and conditioner, so no need to pack them. The hotel provides you with wristbands which open your door so you don’t have to worry about losing your hotel key. The staff are extremely pleasant, thoughtful and efficient...Big shout out to Pablo who was on reception; he was so lovely he even gave me my €30 refundable deposit back even though I did not have my receipt, and he could have quite easily refused to...THANX PABLO!!! So there’s a tip for you save your receipt so you can receive your money back on departure. The pool n jacuzzi areas are amazing there are about 3 different pool areas which are maintained to a high standard. 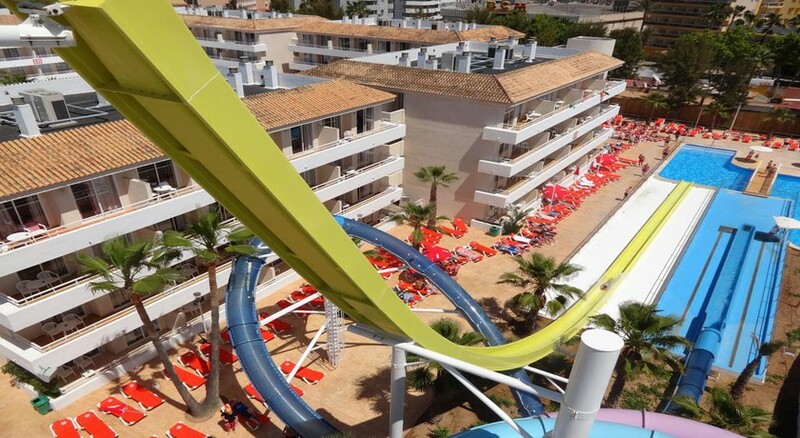 The water slides wow wow wow!!! These were great fun and there are multiple life guards keeping a watchful eye! The DJ played on the decks by the pool which set off a party atmosphere. But if you would prefer a quieter environment there are loads of pool sides to choose from. The guests range from 18- 70+years...yes 70+ so this hotel suits all ages 18+. There is also plenty of security around 24hours on all the entrances so we felt really safe and secure also as we were to females traveling alone. They also patrol throughout the night which I thought was very reassuring. The security guy James was very helpful also by giving us advice n directions on our nights out THANX JAMES!